It is the tradition at the Waldorf School of Garden City for a class to perform a play in their sophomore year, entertaining parents, peers, and the community at large. 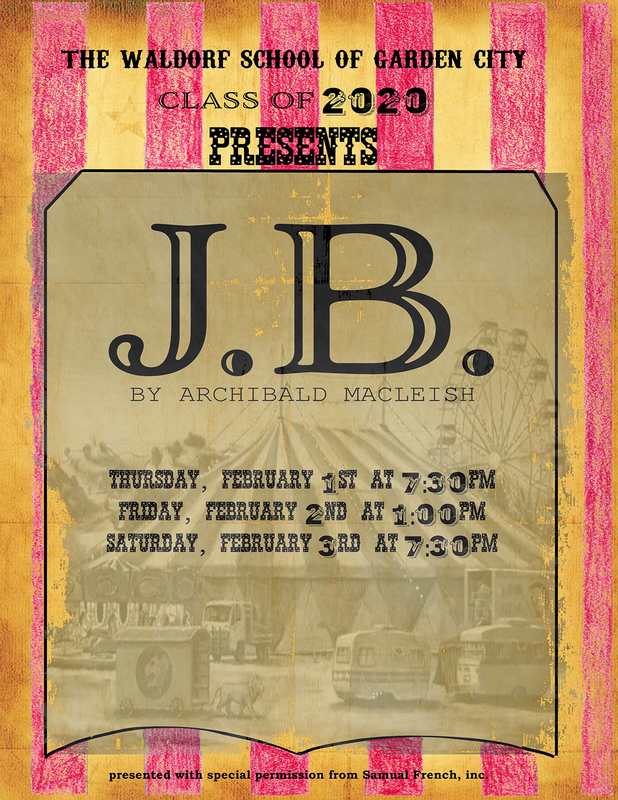 Later this month, the class of 2020 will perform J.B., by Archibald MacLeish. The class of 26 students will perform the play three times: Thursday, February 1st at 7:30 pm, Friday, February 2nd at 1:00 pm, and Saturday, February 3rd at 7:30 pm. All three performances will take place in the school gymnasium and are open to the public. Admission is free but there is a suggested donation of $5.00 to support this team of hardworking individuals. Archibald MacLeish was born in Illinois on May 7, 1892. He studied at both Yale and Harvard Law schools; the latter of which was where he wrote our play. Although he studied law, he also began writing poetry. He moved to France to focus on his writing and there he met other writers like Kay Boyle, Ernest Hemingway, and Ezra Pound. In 1939, President Franklin D. Roosevelt asked him to become the Librarian of Congress, which he was for five years. He later retired from politics, but continued to write. He wrote J.B. in 1958, and it won a Pulitzer Prize. MacLeish died in April of 1982 (Archibald Macleish, poets.org). J.B. by Archibald MacLeish is a modernized retelling of the biblical story of Job. The title character’s life is twisted as two external forces who are particularly interested in his life decide to test his faithfulness. One source represents God and all that is good, while the other represents Satan and all that is evil. Walk with Job as he discovers that there is really no clear delineation between “good” and “evil” when it comes to how life unfolds. Feel the emotions that Job feels as he is tested time and time again. As a body, we the students at the Waldorf School of Garden City use the many different disciplines that our school has taught us in order to successfully present this play. The artistic capabilities that our teachers have spent all of this time cultivating are brought together to create a noteworthy performance that will stay in our minds forever. Plays like this, because of all the extra time we spend together, bring classes closer than they have ever been. They say that all good things must come to an end, but luckily for us, this isn’t over yet. Founded in 1947 and located at 225 Cambridge Avenue adjacent to Adelphi University, The Waldorf School of Garden City offers classes from nursery through grade 12 and is accredited by the New York State association of Independent Schools (NYSAIS) and the Association of Waldorf Schools of North America (AWSNA). For more information, call (516) 742-3434 or visit: www.waldorfgarden.org.